All For Blue team made its own gift to Panormitis church in Symi. A few days after the celebration of the Archangel Michael and Gabriel, with the thousands of people arriving to Panormitis of Symi, Katerina Topouzoglou and All For Blue team traveled to the picturesque island of the Dodecanese to make their own gift to Archangelos Michael Panormitis, an underwater clean up in front of the imposing Holy Monastery with its impressive bell tower. The weather conditions were absolutely favorable, with sunshine continuing on the southeastern edge of Greece. 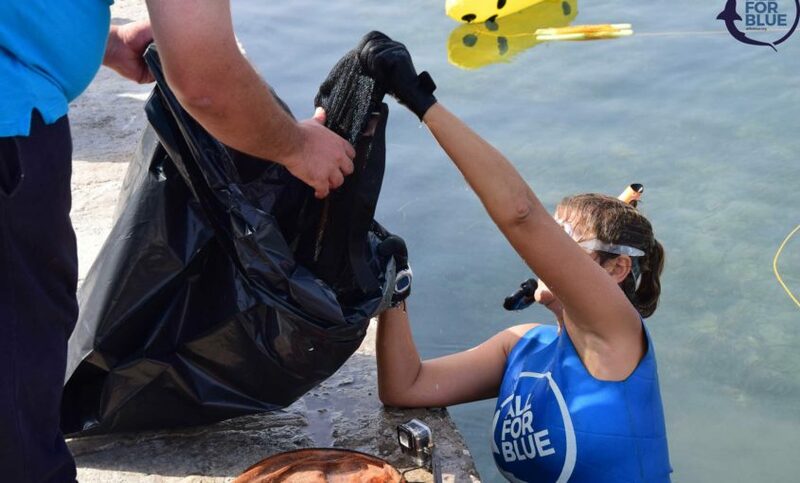 Katerina Topouzoglou and the team of All For Blue freedivers, dove into the turquoise waters of the Panormos Bay and removed more than 150kg (330lbs) of trash, including wheels, glasses, hats, clothes, plasticbags, cans, bottles and more. It was their own way of saying “thank you” to the Archangel. On the occasion of their visit to the Monastery of Panormitis, Father Antonios guided the team to the church and informed them about the story. For All For Blue team, the visit to the island and especially to the Monastery was a different experience. Not only for the beautiful green landscape. Not only because Panormitis Monastery has now given its name to the Panormos Bay, a Monastery built literally on the sea, at least from the 15th century, decorated with a beautiful bell tower. Not only for the imposing image of Archangel Michael dominating the ecclesiastical space. It is the relationship of Panormitis with the sea, which makes lovers of the ocean, to acquire a special relationship with him at the first visit. These are the hundreds of vows that have been gathered in the Monastery’s museum and which have to tell each of them a different story of faith and hope. A large number of boat, wooden, but also silver, small cans and bottles have been kept in the museum, which brought the sea from far away. There is a tradition, especially for sailors, to put money and names in bottles to read through the sequences and to throw them into the sea. In a miraculous way, her waves lead them to Panormitis, as far as their journey is.